The Protected Areas Network Office (PANO) together with PAN Fund (PANF) is pleased to announce the opening of the Competitive Grants and Capacity Building Scholarship Program for 2019. The first program is known as the Competitive Grants Program. It is a one-time opportunity for PAN Member States to enhance their existing efforts in effectively managing their unique natural, cultural, and historical resources within their respective protected areas. For this program, PAN State’s proposed projects should address at least one or both of the following areas of focus: (1) Monitoring and Special Studies and (2) Tourism Management. 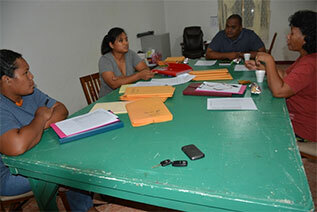 Applicants will go through a two phase application process. The first phase involves submitting a concept note electronically between March 8 – April 6, 2019. Upon approval of concept note, the second phase of the application process will require a completed electronic application form turned in to the PAN Fund Grants Officer, Ms. Jovalyn Koshiba at jkoshiba@palaupanfund.org. The second program, the Capacity Building Scholarship Program, is an opportunity available for Palauans who are interested or are already involved in Palau’s conservation efforts advance their career in conservation. There are two components to this scholarship program. The first component is the Internship component, which is geared towards supporting Palauan students integrate knowledge gained through their classroom learning into a professional work setting. Awarded applicants will receive $400 biweekly stipend along with airfare coverage. Deadline to apply is April 1 or November 1 of this year. The second component, which is the Training component, is aimed at supporting PAN employees (PAN State, PAN Office, or PAN Fund) supplement the cost of their attendance to related capacity building or professional development training. Scholarship award will not exceed $5,000. Applicants must submit application and other requirements at least 2 months prior to training dates. For more information on eligibility and specific requirements, please visit the PAN Fund office (located at the Tommy E. Remengesau Bldg. on M-Dock road) or visit the website at www.palaupanfund.org and access the Competitive Grants Program and the Capacity Building Scholarship Program Application Packages. Melekeok Nature Reserve Board (MNRB), Omar Faustino Program Manager Ngardok Nature Reserve, and relevant members and staff of Melekeok State and PANO/PANF Offices. The Ngardok Nature Reserve has made tremendous conservation gains in the ten years that it has been a PAN site. It has worked to increase the conservation status of Palau’s forest resources through its groundbreaking work on reforestation measures, improved Palauan understanding of wetland forest ecosystems and the biodiversity that utilize it as well as numerous terrestrial species research such as the orchid taxonomic work that is ongoing now. While these conservation achievements are notable, what is even more noteworthy is the fact that they were achieved despite challenging conditions. The most significant of which is the Reserve’s lack of stable communication infrastructure. Collaborations between PNCC, PANO/PANF, Ngardok Nature Reserve and Melekeok State Government proved to be worthwhile. As a result, the initial payment of $22,403.74 was given to PNCC to begin its work on site. The remaining $2,489.31 will be paid in full after completion of the installation. The total cost for the service is $24,893.05. “This is a colossal achievement,” said Program Manager Faustino. Achieving this monumental event with the new telephone service at the Reserve will definitely advance our efficiency and effectiveness of the Reserve to meet its management objectives. The following is a short list of how this will improve delivery of the Reserves mission and strategies. Increase the ability of the Reserve to be proactive in building capacity of their staff through distance learning opportunities, web based learning platforms etc. The cost of this infrastructure is nearly $25,000.00. The amount is beyond NNR’s financial capabilities and as such and therefore, funding support from the Palau Protected Areas Network Office tremendously helped remove the limitations of NNR operations. “We believe that supporting Ngardok Nature Reserve by this infrastructure development is a sound investment that ensures the ongoing productivity and management effectiveness of Palau’s first PAN site”, said Omar Faustino. He also would like to express his sincerest gratitude to the PANO/PANF, PANF Board, PNCC, MNRB, and NNR staff for their continued support and cooperation. Without their enthusiasm and efforts, this particular event would not have been achieved so successfully. Koror, Palau (July 25, 2018) - Ngatpang is the latest state to join the national Protected Areas Network. 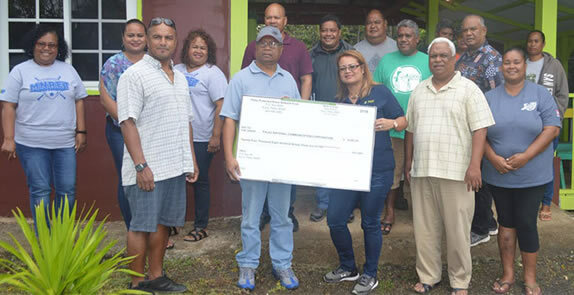 Upon the completion, review and approval of their protected areas management plan, the State accessed its first annual operational funds at the beginning of fiscal year 2018. This first disbursement of funds included the cost of a boat to be used for enforcement and monitoring of the 3 marine protected areas in Ngatpang. 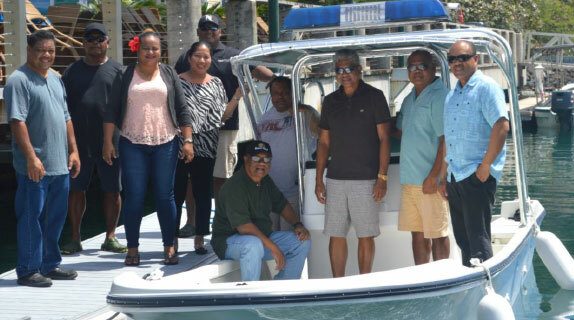 On June 27, 2018, the PAN Office and PAN Fund met with Governor Jersey Iyar and representatives of traditional and elected leaders to hand over the 25-footer, twin 85hp boat to the Ngatpang State PAN Program and state PAN coordinator, John Techitong. During this first year of operations, the Ngatpang State PAN program has focused on recruiting staff, establishing the office, and procuring necessary equipment. Koror, Palau (July 13, 2018) – Palau Protected Areas Network Fund (PAN Fund) and Palau Protected Areas Network Office (PAN) concludes the PAN Recognition Program for fiscal year 2018 with a Learning Exchange to the 2018 Scuba Show in Long Beach, CA June 23- 24, 2018. This year's recognition program was initiated with "Employee of the Year" program where PAN Members States (Governors and Coordinators) were given the opportunity to nominate their PAN employee of the year. Thirteen PAN employees were formally recognized and honored for their excellent work during the PAN Appreciation Event held on May 24, 2018. The second part of the recognition program was implemented shortly after with the objective of rewarding PAN Member States meeting certain reporting criteria and their level of efforts in becoming a self-sufficient sites. 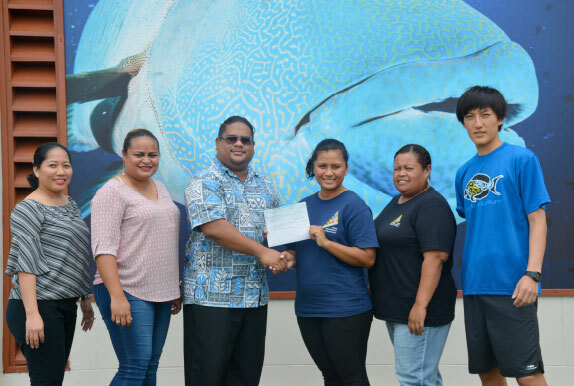 Four PAN member states namely Ngarchelong State, Melekeok State, Ngeremlengui State and Ngardmau State received the highest scores and were formally rewarded with an opportunity to showcase their PAN program in the 2018 Scuba Show, in partnership with the Palau Visitors Authority, Palau Marine Sanctuary and Heirs to Our Ocean. Amongst the PAN member states participants were Paloma Swei representing Ngarchelong State, Loma-Linda Gabriel representing Melekeok State, Elicio Skebong representing Ngeremlengui State and Jennifer Kedals Ngiraiwet representing Ngardmau State. The event was a huge success! PAN representatives had the chance to interact and mingle with both exhibitors, customers and other conservationist. PAN representatives also participated in a seminar hosted by the Palau Visitor's Authority and had the opportunity to showcase their individual State attraction to an audience of approximately 40 people. "It was an eye-opening experience that enabled us to market our conservation efforts" said the PAN member state participants. Both PAN Fund and PAN Office hope to capitalize on these partnerships to support PAN member States in developing and implementing site-based sustainable financing plan to complement the PAN Sustainable Financing Plan. Adaptive management of protected areas requires good information as a basis for decision making and management actions. To support management of Palau’s MPAs, especially Protected Areas Network (PAN) marine sites, Palau International Coral Reef Center (PICRC) has been conducting studies to assess conditions of almost all of PAN marine sites. Because of its remoteness and the cost required to conduct complete assessment of Helen Reef, PICRC has not conducted studies there since 2007. Because of financial support from PAN Fund and the Ministry of Natural Resources, Environment and Tourism, PICRC was able to conduct comprehensive surveys at Helen Reef from June 7 to June 13, 2018. During the surveys, researchers from PICRC assessed corals and other marine animals, big invertebrates such as sea cucumbers, clams and trochus. The fish communities were also studied to determine biomass and abundance. To assess the health of coral populations and future conditions, researchers also studied juvenile or baby corals to get a sense of how well future populations will thrive. Despite its remoteness, monitoring Helen Reef Conservation Area remains critical to its management. Through ecological surveys PICRC is able to determine the status of conservation areas and provide recommendations to stakeholders and policy makers. In three days, PICRC researchers conducted 130 transects at 13 different sites around Helen Reef. Now, they will analyze the data from this trip to determine the trends since the last survey in 2007. Palau celebrated the second year since the signing of President Tommy Remengesau’s signature policy- Palau National Marine Sanctuary Act. On October 28, 2015, Remengesau Jr., sign into law the Palau National Marine Sanctuary Act. After a five-year transition period, the Palau National Marine Sanctuary will encompass over 80 percent of Palau’s Exclusive Economic Zone (EEZ), an area of most 500,000 square kilometers. The remaining 20 percent will be reserved for traditional fishing and highly regulated and reformed domestic fishing fleet to serve only Palau’s domestic and tourism needs. On its second year, Palau has been working with satellite technology providers like google, Vulcan and Ocean Mind to help monitor its waters. According to PNMS Executive Director Keobel Sakuma. Palau is also receiving new patrol vessels from Japan’s Nippon foundation and Sasakawa Peace Foundation. PSS Kedam is nearing completion with new maritime patrol officers being trained. The entire donation package is on schedule and slated to be delivered in February of 2018. Australia has also committed to continue their assistance to Palau through the Pacific Maritime Security Program and will replace the aging PSS Remeliik with a new Patrol Vessel in 2019. PNMS has also entered into an agreement with Pacific Mission Aviation, a local airline with operations in Palau and the FSM that will provide aerial surveillance to support the Marine Law patrols. In January, the Pristine Paradise Environmental Impact Fee (PPEF), a key component of the marine sanctuary law will be implemented. The new fee will be included in the ticket price for all travelers coming to Palau. The estimated collection of the revenue for the PNMS alone will be approximately 1.4 million USD annually and about $2million USD do the states to replace any fishing revenue that has been diminished due to the ending of commercial fishing exports in 2020. 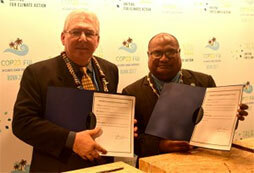 Palau is also developing strategy for the creation of the Domestic Fishing Zone covering 20 percent of Palau EEZ. The report said that Palau is developing a domestic fishing plan that would allow vessels for a domestic fishing fleet; a central Fishing Auction and Processing, a Central Market in which the local fishermen can sell their catch; a wharf for the auction facility and central market; and fish aggregating Devices(FADS) within the Domestic Fishing Zone that will attract pelagic fish for benefit of the local domestic fishermen. “Much has been achieved, yet the bulk of our remains to be undertaken. Only with patience and an understanding of the monumental effort required to effectively protect and manage an area of over 620,00 square kilometers will Palau succeed.” Sakuma stated. BONN, 16 November 2017 (PIDF) — The COP23 Climate Conference has been a special place for the Pacific this year. Today the Republic of Palau signed of the instrument of accession to the Pacific Islands Development Forum (PIDF) making it the organization’s 14th member (12-member state). The PAN was established in 2003 to protect Palau‘s rich biodiversity and to build resiliency to the impacts of climate change. In 2015, baseline ecological studies were conducted in the PAN Marine Protected Areas (MPAs) to assess their effectiveness. While understanding the effectiveness of the PAN on Palau’s ecosystems is critical, it is also necessary to evaluate the effectiveness of the PAN through the public’s perspective. In order to gauge the communities’ perception of these protected areas, PICRC began conducting socioeconomic baseline surveys to complement the ecological studies done in the state PAN sites. This month, PICRC released a new technical report titled “Socio-Economic Baseline Study in Ngatpang State. “The report highlights the Ngatpang community’s involvement in their designated PAN sites, their level of awareness and knowledge of the PAN and their overall perception of impacts from MPAs on their livelihoods. PICRC researchers have completed surveying nine states and aim to complete baseline surveys for the remaining four states over the next two years. These studies provide valuable information that can assist policy makers in improving the PAN to better suit local communities and ensure success of the sites. PICRC would like to offer thanks to all the volunteers and surveyors for their efforts on this study. More information on this report can be accessed through the PICRC website under Research Publications and Technical Reports. Please contact Ines Kintoki for further questions or comments.